On paper, the notion of combining a DAC, analogue input circuitry, source switching, and amplification to create a single, do-it-all box looks like a no-brainer, yet in practice it’s remarkable how often the collision of theory and reality results in a debris field of unfulfilled promises. The history of digital-integrated amplifiers is littered with examples that haven’t just fallen short: in musical terms they’ve totally failed to launch, their digital circuitry upsetting their analogue side or vice versa, resulting in the bleached, disjointed, fractured, and a-musical results we’ve all been exposed to. But things are finally starting to change, with first the Levinson 585 stepping up to the plate and then the CH Precision I1 hitting it out of the park. But if anybody should be able to untangle the digital-integrated Gordian knot, then it’s Goldmund, a company that has been not just combining DACs and amplifiers for longer than most, but building them into loudspeaker cabinets to boot. The rest of the fascia tells its own story, the simple display giving you a basic numerical indication of input (USB, Toslink, S/PDIF digital, or one of five analogue connections) and volume level. That’s your lot: so no oversized alpha-numeric display with programmable source names and switchable colour options; no choice of digital filters or up-sampling; no balanced connections or any outputs (digital or analogue) and no control app – Apple or otherwise. In fact, no frills of any kind – which is kind of refreshing in this day and age, where designers seem to have forgotten that just because you can it doesn’t mean you should. The Telos 590 is about as straightforward as a digital integrated can get, which given its £24K price-tag definitely sets it apart from the herd. The minimalist styling is matched by the performance-orientated design so make no mistake, the Telos 590 is all business – and nothing but business. If there is a single overarching principle that defines Goldmund’s approach it can be summed up as low-loss design. In turn that is embodied in wide-bandwidth topology, headroom, and mechanically grounded chassis designs, approaches that Goldmund adopted early and made central pillars of everything they do. It helps explain their preference for digital signal transfer, the high power ratings of their amplification, and the incredibly rigid casework they use on their products. 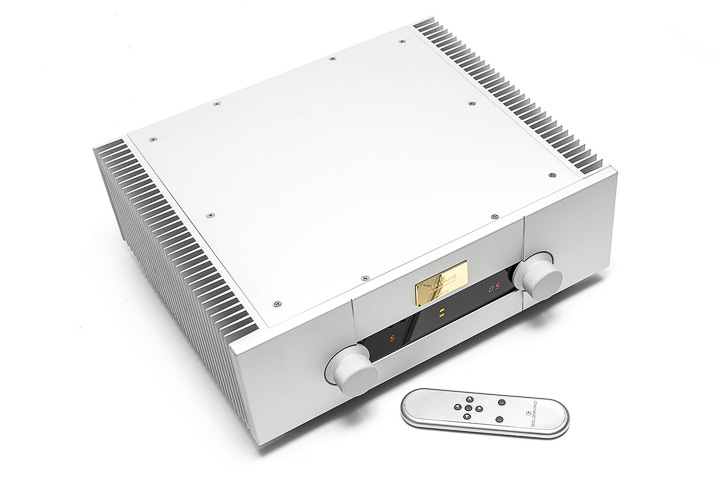 In the Telos 590 that is reflected in the substantial aluminium panels and heat sinks that make up the visible surfaces, but more so in the thick steel base plate to which the output devices and transformers (one for each channel) are bolted, and which sits on four adjustable, cone feet. Getting those feet rigidly coupled to the supporting surface matters, as does the surface itself. The Goldmund grounding strategy demands a solid, dispersive support and using an HRS M3X platform reaped significant musical dividends in terms of focus, colour, and an even greater sense of purpose to the playing. This amp is rigidly coupled in a way that few others are, while the obsession with eliminating spurious energy while maximising bandwidth and headroom ensures that the traditional Goldmund attributes of detail, transparency, and lightning-fast dynamic response are all present and correct. So much so that the Telos 590 sounds significantly more capable and powerful than its 215Wpc rated output might lead you to expect. It’s the speed that makes that difference, giving music a surprising sense of impact and momentum, but there’s more to this amp than that.